Tanker with mechanical drive. Driven with steam machine. Ship driven by one four blade screw with regular stroke. Crew 34 persons. Two deck construction. Built in August 1889 for shipowner Siemers, in shipyard Sir W. G. Armstrong, Mitchell & What, Low Walker number plans 553, under name S / T BURGERMEISTER PETERSEN. Delivered to use 17.09.1889. From 27.05.1891 she served for D. A. P. G. (Deutsch Amerikansiche Petroleum Ges, Hamburg).From 19.09.1914 she served as auxiliary ship for Uboots ( he was used as an oiler). 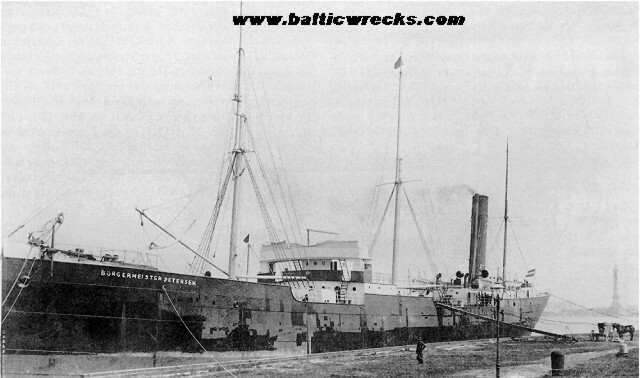 From 27.10.1915 she transferred to Kaiserliche Werft Danzig as oiler to transport fuel for ships. On 10.11.1915 she was destroyed by mine and sunk. 20 crew members died. Shipowner Siemers, DAPG, service in navy..